He gained worldwide notoriety for smoking crack cocaine while in office. 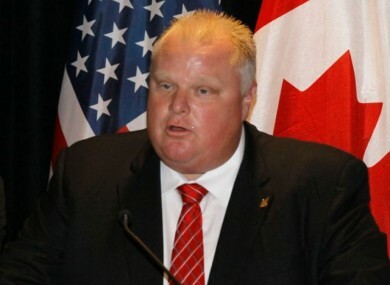 Rob Ford, pictured in 2012. FORMER TORONTO MAYOR Rob Ford, an anti-tax populist who gained worldwide notoriety for smoking crack cocaine while in office, was laid to rest today after a losing battle with cancer. Hundreds gathered at city hall where Ford’s body lay in repose for two days. A procession to nearby St James Cathedral was followed by a packed funeral service. His wife Renata blew kisses into the crowd of supporters who waved paper ‘Ford Nation’ flags while chanting “Rob Ford, best mayor ever,” as they marched passed a massive Canadian flag erected atop two fire truck cranes. Provincial and municipal leaders put aside partisan differences to pay their respects to a man they once fiercely denounced. “He believed in…doing what he said he would do. All those in public life could learn a couple things from him,” he said. After a private burial, the public was invited to a convention center where Ford launched his longshot mayoral campaign in 2010. His unexpected win turned Canada’s usually staid politics on its head, after an alleged drug dealer tried to sell a video of the mayor apparently smoking crack. At first, the rotund Ford denied using the drug, but he later acknowledged having smoked crack cocaine in a “drunken stupor”, insisting he was not an addict. Toronto’s city council stripped him of most of his mayoral powers and Ford entered rehab soon after the emergence of the sensational video. He said he was struggling to get the upper hand over his personal demons, even as his behavior became increasingly erratic. Throughout the scandal, Ford was dogged by calls for his resignation, although public support remained relatively high. Ever defiant, Ford vowed to stand for re-election in 2014, but in the end opted not to run so he could focus on his failing health and his chemotherapy treatments. Email “'He's mayor of heaven now': Mourners pay final respects to controversial politician Rob Ford”. Feedback on “'He's mayor of heaven now': Mourners pay final respects to controversial politician Rob Ford”.